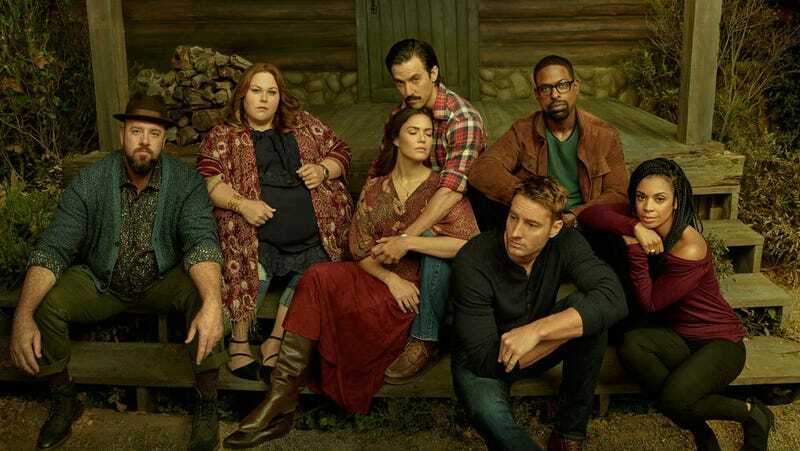 This Is Us (NBC, 9 p.m., midseason finale): So, this episode is called, “The Beginning Is The End Is The Beginning,” which is perhaps the This Is Us-iest episode title in the history of This Is Us. Based on the description of what’s to come, it seems likely to live up to that ouroboros of a sentence: We’ve got Kevin (Justin Hartley) and Zoe (Melanie Liburd) arriving in the Ville where, in an earlier time, Jack (Milo Ventimiglia) is trying to get through to his brother (Michael Angarano); We’ve got Randall (Sterling K. Brown) ready to debate Councilman Sol Brown (Rob Morgan) while Beth (Susan Kelechi Watson) struggles to find her place in his campaign; and we’ve got Kate (Chrissy Metz), who “pursues a new opportunity,” which sounds pretty innocuous but is probably gonna be the heartbreaker of the episode, seeing as it is so tantalizingly vague. If nothing else, it would seem that we’re assured of Randall channeling his inner Leslie Knope, and that, dear reader, is reason enough to watch. Caroline Siede’s recapping abilities have earned our enthusiastic endorsement. Goatface: A Comedy Special (Comedy Central, 10 p.m.): Would someone please get Hasan Minhaj a cup of coffee? The man has had quite a year. He snagged a 32-episode order for Patriot Act, his terrific weekly Netflix series; he also turned out one of the year’s best comedy specials and was a real piece of work in The Spy Who Dumped Me. Yet somehow he made time to film this special with sketch group Goatface, which also includes Asaf Ali, Fahim Anwar, and Aristotle Athira. While concerned for his work-life balance, we’re also very much looking forward to Goatface’s TV debut.